Move the JSON file that you downloaded after creating your OAuth 2.0 client ID to the src/main/resources directory below your working directory, and rename the file to client_secret.json. In the build.gradle file, you need to replace the REVISION and CL_VERSION variables with two values from the client library documentation for the YouTube Data API. The screenshot below, which shows the documentation for the YouTube Analytics API, shows where the two variables appear on the page. The right side of the fullscreen APIs Explorer shows tabs with code samples in different languages. Select the Java tab. Copy the code sample and save it in a file named src/main/java/ApiExample.java. Every sample uses the same class name (ApiExample) so that you don't need to modify the build.gradle file to run different samples. As with the previous example, select the Java tab, copy the code sample, and save it to src/main/java/ApiExample.java. The sample should attempt to open a new window or tab in your default browser. If this fails, copy the URL from the terminal and manually open it in your browser. 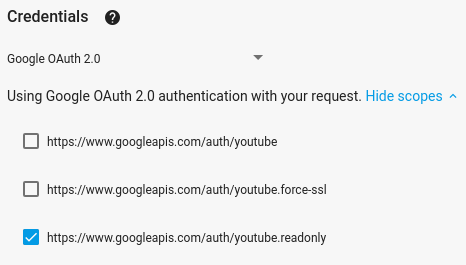 The sample will proceed automatically, and you may close the browser tab used for the auth flow.